Fraxel™ Re:Store DUAL is now available at Infini Cosmetic Associates in Scottsdale, Arizona. The Fraxel™ Re:Store DUAL laser treatment is the most current Fraxel™ technology and an improvement in this “gold-standard” fractionated laser. The Fraxel™ DUAL has the unique advantage of offering two laser wavelengths within one machine, providing three different treatment options to effectively target both the surface and deeper layers of the skin. Fraxel™ 1550nm Laser – This is an erbium fiber laser that penetrates deep into the skin layers, specifically targeting concerns such as wrinkles and scarring. Fraxel™ 1927nm Laser – This is a thulium fiber laser, and the only thulium laser available for cosmetic treatment today. It effectively targets discoloration, or unwanted pigment in the skin, tone, texture and other more superficial signs of aging. 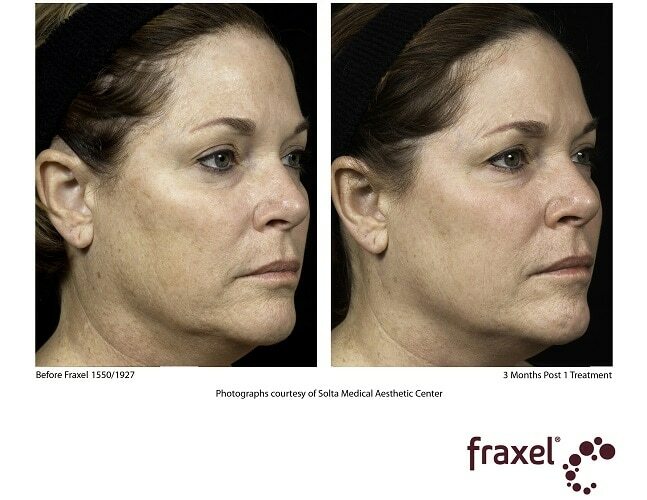 Fraxel™ DUAL 1550/1927 – Using both the erbium and thulium lasers, the Fraxel™ DUAL treatment targets both superficial and deeper signs of aging. Fraxel™ treatments are safe, non-ablative laser treatments and will be tailored to your specific concerns and desired outcomes. Even after your first treatment, you will begin to see and feel the difference in your skin. After a series of treatments, which is typically recommended, your results will be dramatic! Call Infini Cosmetic in Scottsdale Arizona today to schedule your complimentary consultation! Register online for you Free Consultation Certificate and scroll down to the FAQ below for answers to the most common questions about laser skin treatment. Fraxel™ treatment uses patented fractional technology to target damaged skin within microscopic laser columns that penetrate deep into the skin. The laser treats only a fraction of tissue at a time, leaving the surrounding tissue untouched, which promotes rapid healing. This stimulates your body’s own natural healing process, replacing the old and damaged cells with fresh, glowing, healthy skin. The results are both immediate and progressive. Soon after the treatment, the surface of your skin will feel softer and smoother, look brighter and show more even skin tone. The next 3 to 6 months will bring more improvement as the deeper layers of the skin continue to create new collagen. Results are long lasting depending on your lifestyle, age, skin condition and skin care regimen. Desired outcomes are typically reached in multiple treatments. The specific number of treatments is tailored to your goals and desired results. Infini Cosmetic will work with you to identify the appropriate level of treatment and an estimate of how many treatments may be needed to reach your goals. Depending on the level of treatment, you may experience redness and swelling after the procedure which begins to resolve as quickly as the next day or over the next several days. Your skin may appear bronze and have a “sand paper” like feeling. The skin will flake and exfoliate normally over the next 3-7 days after treatment, revealing fresher, glowing and smoother looking and feeling skin. Fraxel™ Re:Store DUAL treatment is a safe laser treatment option backed by extensive research and FDA approved for melasma, sun damage, wrinkles and scars. Of course, as with any laser procedure there is always some risk and/or potential downtime. Contact Infini Cosmetic today and schedule your complimentary consultation to see which Fraxel procedure is best for you and to answer all of your questions.